We are all familiar with the principle of ultrasound used to locate objects. Bats, dolphins and whales emit pulsed sounds or 'clicks' for echolocation to detect their prey or to communicate, submarines emit sonar pulses to detect enemy submarines. Ultrasound imaging or sonography is a popular tool in medicine to visualize muscles, tendons or internal organs with real time tomographic (sliced) images. Future mothers often use a 'funscan' to visualize their fetus. Ultrasound devices operate with frequencies from 20 kHz up to several gigahertz, much above the upper audible limit of human hearing. An interesting recent application of ultrasound is the acoustic camera to observe the movement and behavior of sharks transiting narrow sea passages. Douglas J. McCauley and coworkers from the University of California Santa Barbara used a ultrasound sonar device called DIDSON (Dual-frequency Identification Sonar) to ‘acoustically gate’ a portion of sharks moving in and out a corridor of Palmyra Atoll. Palmyra is an 5-square-mile ring of coral halfway between Hawaii and American Samoa, and a sanctuary for a variety of mobile species including sharks, manta rays and turtles. The area is protected as a U.S. National Wildlife Refuge and its lagoon and surrounding coastal waters are declared “no-take” zones. The DIDSON submersible sonar unit is small and nearly neutrally buoyant in water. The unit permits high-resolution digital imaging of objects within the sonar's field of view. It is especially useful in low-light, turbid waters to study movements of fish or marine mammals in environments where fishes are physically constrained through natural or artificial environmental gateways. Or harbor entries, ship wrecks and other fish habitats. The weak point however is that the device does not permit to identify individual species, although it is possible to distinguish fishes on the basis of their gobal shape and size. The acoustic camera near-continuously monitored a 42 m3 section of channel space. The maximum linear distance visualized by the acoustic camera was 10 m. Investigators mainly tracked movements of blacktip sharks (C. melanopterus), the most common shark observed in Palmyra's lagoons (see picture above: acoustic camera recorded image of a shark moving through the sonar unit's field of view , source*). They found that shark density and directionality of travel through the channel at night was more than three times greater than that of sharks moving through by day. Peaks in shark densities (‘rushing hours’) were specifically recorded during the post-dusk period (1909–2009 h). Moursund, R. A., Carlson, T. J., and Peters, R. D. 2003. 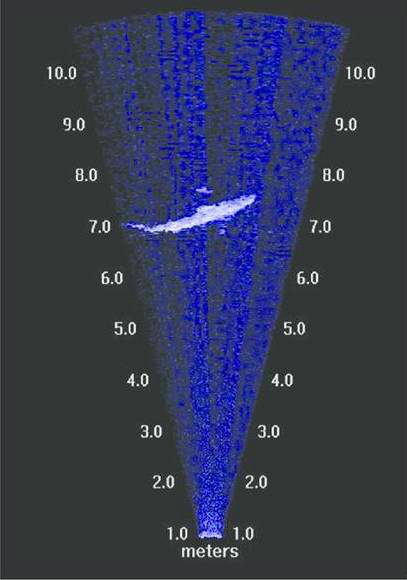 A fisheries application of a dual frequencyi dentification sonar acoustic camera. – ICES Journal of Marine Science, 60: 678–683.